Search.macsafefinder.com is the PUP that uses misleading techniques to prevent removal. Use Reimage to locate malicious components and get rid of them faster than with uninstall instructions. A full system scan blocks virus reappearance and prevents traffic to malicious domains. Search.macsafefinder.com (by Linkury, Ltd.) pretends to be a useful search engine. However, it is also known as a browser hijacker that arbitrarily modifies user’s browser settings without his/her consent. Typically, it targets Mozilla Firefox, Safari or Internet Explorer users. At first sight, it may seem a very reliable search engine since Mac Safe Finder looks similar to Google, Yahoo or Bing. However, users should be aware that after the installation it alters new tab URL, homepage, and default search engine by assigning to hxxp://www.search.macsafefinder.com. The changes may deceive you as being useful because once you perform a search, it displays the results as a “Yahoo search.” At this point, we want to assure you that this browser hijacker only PRETENDS to operate in the Yahoo search. You can check the link provided in the address box and compare it to the one in verified Yahoo search engine – they are different. In fact, this questionable program is a variant of Safe Finder virus, which is also associated with other browser-hijacking tools promoting fake search engines such as Search.safewebfinder.com or Search.websafefinder.com. Even though Mac Safe Finder is not a virus, it may stealthily install potentially unwanted programs (PUPs) and plug-ins. They typically reassign browser settings mentioned above to hxxps://www.search.macsafefinder.com every time user tries to change them to the previous state. Thus, search.macsafefinder.com removal may become a complicated and time-consuming process. Search.macsafefinder.com browser hijacker is closely related to Safe Finder, an untrustworthy program developed by Linkury, Ltd. The hijacker promotes a fake search engine and collects browsing-related data during victim's browsing sessions. We strongly advise you to avoid clicking on any types of ads since they may redirect you to suspicious websites that might distribute high-risk computer infections. If you decided to remove search.macsafefinder.com, our IT specialists suggest using Reimage or any other reliable security software. The so-called browser hijacker may spread by taking advantage of computer users who are in a rush. They choose Quick/Recommended installation process and are not able to deny the installation of a potentially unwanted program (PUP) that is hidden among “Optional Components” of the regular application. Therefore, we advise choosing Custom/Advanced settings while installing software. Also, you can always protect your files and data by using security software. Experts from Zondervirus.nl state that it is best to use antivirus and anti-malware or anti-spyware software in tandem for best results. After getting infected with the described program, you have two options to remove search.macsafefinder.com virus – automatically or manually. Be aware that your computer might not only be attacked by Mac Safe Finder, but also by other viruses that deceive you with the behavior of a “regular” app while stealthily performing suspicious activities. Thus, our team suggests choosing automatic search.macsafefinder.com removal option and using a reliable security software. You should download it from authorized developers as mentioned above. After the installation, let it scan your computer files thoroughly and detect possible threads. It is the safest option to remove various types of malicious programs and protect your data. If you opt to eliminate search.macsafefinder.com manually, you IT specialists have prepared a detailed step-by-step guide provided below. Here, look for Search.macsafefinder.com or any other recently installed suspicious programs. To delete MacSafeFinder from Mac, follow the guidelines provided below. Make sure you empty the Trash bin after removing components of the defined spyware variant. Wait until you see Applications folder and look for Search.macsafefinder.com or any other suspicious programs on it. Now right click on every of such entries and select Move to Trash. When in the new window, check Delete personal settings and select Reset again to complete Search.macsafefinder.com removal. Once these steps are finished, Search.macsafefinder.com should be removed from your Microsoft Edge browser. Here, select Search.macsafefinder.com and other questionable plugins. Click Remove to delete these entries. Now you will see Reset Firefox to its default state message with Reset Firefox button. Click this button for several times and complete Search.macsafefinder.com removal. Check chrome://extensions panel and delete MacSafeFinder components: SafeFinder, Linkury. Reset the browser afterward. Here, select Search.macsafefinder.com and other malicious plugins and select trash icon to delete these entries. Click Reset to confirm this action and complete Search.macsafefinder.com removal. 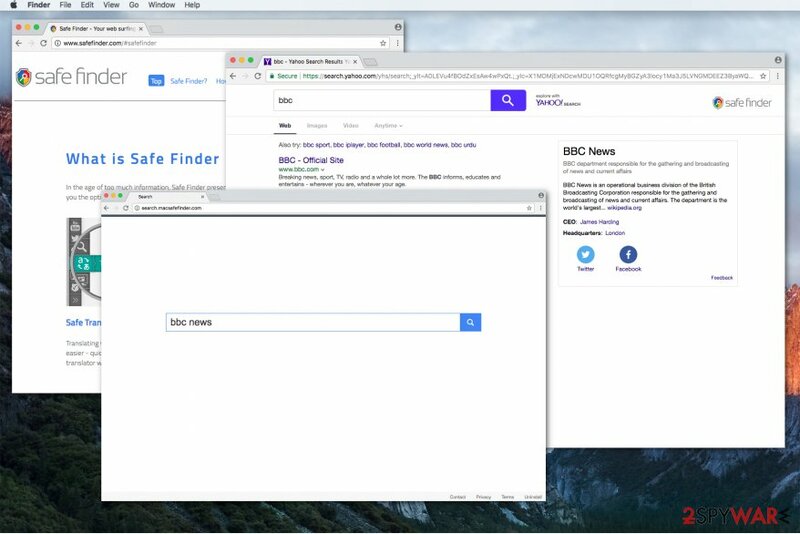 Here, select Extensions and look for Search.macsafefinder.com or other suspicious entries. Click on the Uninstall button to get rid each of them. Here, look at the Homepage field. If it was altered by Search.macsafefinder.com, remove unwanted link and enter the one that you want to use for your searches. Remember to include the "http://" before typing in the address of the page. Now you will see a detailed dialog window filled with reset options. All of those options are usually checked, but you can specify which of them you want to reset. Click the Reset button to complete Search.macsafefinder.com removal process. ^ Rahul Kashyap. Why Malvertising Is Cybercriminals’ Latest Sweet Spot. WIRED. Science, Business, Design News. ^ ZonderVirus. ZonderVirus. Security and Spyware News, Virus Removal Tutorials. This entry was posted on 2017-10-20 at 04:50 and is filed under Stealing programs, Viruses. You can quickly scan the QR code with your mobile device and have Search.macsafefinder.com virus manual removal instructions right in your pocket. How did you remove Search.macsafefinder.com virus?